Individual Septic Systems or Onsite Wastewater Disposal Systems are required for residential, commercial and industrial buildings that are not connected to municipal or public wastewater systems/treatment plants. The Onsite system is designed to receive and treat wastewater and return the treated effluent into the groundwater system. Designed and installed correctly, an Onsite Wastewater Treatment System will treat the wastewater and return effectively clean water back to the ground. From expert installation to dependable emergency repairs you can count on proven experience. Experience the convenience and value of our comprehensive septic system installation services. From site excavation and preparation to installation and replacement, our years of experience means that you can count on us for all of your needs. 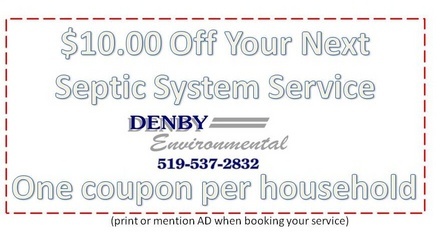 Denby Environmental is a full service, on-site wastewater-management company, servicing both residential and commercial septic systems. We are committed to "Protecting Our Groundwater...One Septic System at a Time". We pledge to be a leader in the industry by introducing the latest in septic system technology, investing in the latest equipment and providing services to help protect our groundwater. Our goal is to educate the public regarding the proper use and maintenance of a septic system and help all of our customers become responsible septic system owners.